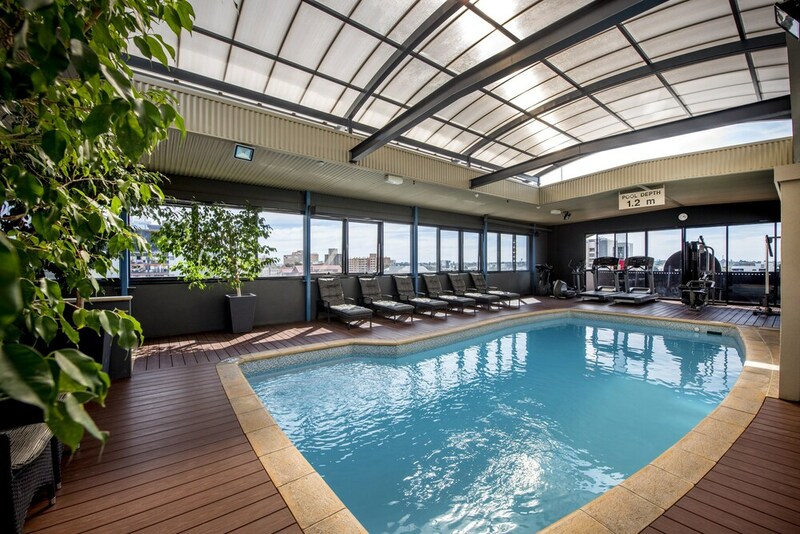 Located in East Perth, Mantra on Hay is in the business district, within a 15-minute walk of Perth Mint and WACA. This 4.5-star aparthotel is 2.2 mi (3.5 km) from Kings Park War Memorial and 2.4 mi (3.9 km) from Hyde Park. Make yourself at home in one of the 154 air-conditioned rooms featuring refrigerators and minibars. Flat-screen televisions with cable programming provide entertainment, while wireless Internet access (surcharge) keeps you connected. Private bathrooms with showers feature complimentary toiletries and hair dryers. Conveniences include safes and desks. Take advantage of recreation opportunities including an indoor pool and a fitness center. This aparthotel also features complimentary wireless Internet access, concierge services, and babysitting/childcare (surcharge). Stop by the aparthotel's restaurant for lunch or dinner. Dining is also available at the coffee shop/café, and room service (during limited hours) is provided. Wrap up your day with a drink at the bar/lounge. Buffet breakfasts are available daily from 6:30 AM to 10 AM for a fee. Featured amenities include a business center, dry cleaning/laundry services, and a 24-hour front desk. Event facilities at this aparthotel consist of conference space and a meeting room. Self parking (subject to charges) is available onsite. Located in the central business district of Perth, Mantra on Hay features a variety of on-site business facilities, including a business center, a meeting room, and secretarial services (on request). For a little fresh air, there is a terrace onsite. The hotel also has a conference room ranging in capacity from 30 to 90 people, event catering services, and a dedicated event staff. Benson's Restaurant and Cocktail Bar are open daily, and room service is available during limited hours. On-site recreational facilities include an indoor swimming pool and a fitness center. Additionally, the hotel has a 24-hour front desk with multilingual staff, a concierge, currency exchange, onsite parking (surcharge), and express check-out. WiFi is available throughout the property for a fee. Open 7 days, Cornerstone Bar & Kitchen is fully licensed and conveniently located within Mantra on Hay. Serving a modern Australian menu, guests will enjoy quality dining, friendly service and a relaxed ambience that reflects Perth’s charming personality. The outdoor terrace also makes it a great place to enjoy a catch up with colleagues or friends over a casual drink. The restaurant is open Monday to Friday for breakfast, lunch and dinner and open weekends for breakfast and dinner. Cornerstone Bar & Kitchen is also wheelchair accessible and has room service available.